Welcome to the GoVoteTN application. Please select one of the options below to access information about your polling places, candidates, districts and elected officials. 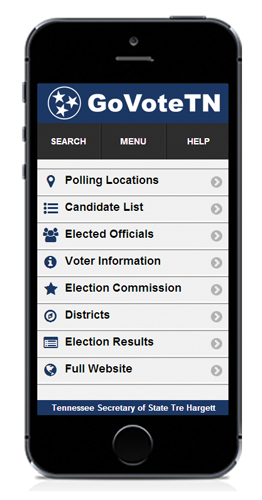 The data accessed through this application is provided by local county election commissions. Please contact us at 1‑877‑850‑4959 or by email if you have any questions regarding the application or Tennessee elections.